The Maze Runner is an exceptional film that is both a thrilling action film as well as a psychological drama. With the plethora of young adult science fiction novels being snatched up by every studio in creation and turned into films, it is hard to disseminate the few good ones from the many bad ones. This holiday season 20th Century Fox introduces film lovers to another one of these films, The Maze Runner, based on the novel by James Dashner, on iTunes Digital HD. 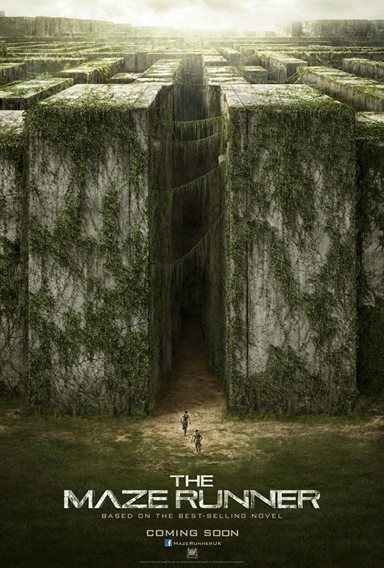 The Maze Runner tells the story of a bunch of teenagers who are mysteriously placed in a small patch of land called "The Glade" surround on all sides by a imposing concreted wall maze. The rules are pretty simple. The maze opens at dawn and closes at night. Anyone caught inside the maze at night with have to face the "grievers" who can cause you to go insane and eventually die. While this overall summary seems a bit rudimentary, it only scratches the surface of the film. While the plot elements described above help to move the story along, the true story of The Maze Runner is the interaction between the various groups and personalities inside the glade as they try to make sense of their lives and try to survive. The entire film resembles a modern take on The Lord of The Flies. Much of the film depends on the actors and The Maze Runner has an exceptional cast of up-and-coming film stars including MTV Teen Wolf sensation Dylan O'Brien, as Thomas, the wily Thomas Brodie-Sangster (Game of Thrones) as Newt, and Will Poulter (We're The Millers) as Gally. The way the cast interacts together on screen is electric and probably one of the best young adults casts seen in a long time. Fox took a chance of casting short film director, Wes Ball, on the project but it truly paid off. Having already had experience directing a CGI post apocalyptic short entitled "Ruin", Ball was up to the challenge and pushed himself and the cast to their limits to create the best film possible. As seen from the very detailed documentary that accompanied this release Ball was involved with all facets of the film from fact checking with the author (Dashner) to the post-production special effects. Even though the Maze Runner is one of the best films of the year the iTunes digital HD copy is not without its problems. While the audio is top notch and completely immerses you in the glade and the maze, the picture is very soft, and the true vision of Wes Ball fails to be realized on screen when compared to the Theatrical run of the film (hopefully iTunes will fix this issue soon). Aside from the film itself, Maze Runner Digital HD comes with a lot of special features normally saved for a Blu-ray release including over an hour in length documentary of the making of the film that is not to be missed. It provides every detail a Maze Runner fan could want. Also included is "Chuck's video diary", and well as a gag reel. The Maze Runner is an exceptional film that is both a thrilling action film as well as a psychological drama that truly breaks through the bounds of the "young adult " stigma left by so many other films. Hopefully Ball and the cast can create the magic a second time around with Maze Runner: Scorch Trials, and iTunes can fix the sharpness issue on this digital release. Download The Maze Runner from the iTunes Store in Digial HD. For more information about The Maze Runner visit the FlickDirect Movie Database.